The hanging of Joe Jump, 19, and John Smith, 22, for the murder of Wm. Gladson on Dec. 29, 1885, was Daviess County’s first and only public execution. The crime took place between the trio of friends  Jump, Smith and Gladson. The hanging of Joe Jump, 19, and John Smith, 22, for the murder of Wm. Gladson on Dec. 29, 1885, was Daviess County’s first and only public execution. The crime took place between the trio of friends — Jump, Smith and Gladson. The original 4.5″x7″ card issued by Sheriff James H. Witt of Daviess County, MO. Both Joe and John were shady characters and had been charged with other serious crimes. Wm. Gladson was a railroad worker and had worked at a grade near the Grand River bridge. Upon the job’s completion he had his pay with him. While in town he met Joe and John and the trio became friends. Joe knew Gladson had money. He told John they should kill him for it. The plot began and Joe placed a pitman rod near a vacant house with a nearby well. The two men found Gladson and said they should go to the old house and play cards. Once there, Joe took the pitman rod and hit him while John held him. John released him and started hitting him with a slingshot. Gladson laid lifeless and they threw his body in the vacant house’s well. The two men divided the money. Joe loaned John $50, but he still had $100 of his dad’s money. He’d already decided to leave town with his money. Upon purchasing a suit, he ripped open the top of its drawers, hid his part of the money in them, and sewed them back. Soon, two negroes, Thomas Dale and Alex Walker, were hauling cheat [oats] to store in the house. Thomas saw a hat laying in the yard and stopped to get it. He saw a small pool of blood and signs of something being drug to the old well. He noticed the rails covering it had been moved and there was blood on its side. One of the men went to town to get help and soon other men arrived and used grab hooks to pull the body from the well and the body was taken to town. The next morning, John repaid Joe the money he’d loaned him. He told him not to spend any of the money around Gallatin, but to take it to Cameron and exchange if for other money. Before long, Joe had his ticket and waited for the train to Cameron. Constable Gabe Cox walked up to him and told hem he had a warrant out for his arrest for the murder of William Gladson. He was taken to the depot and searched, but didn’t find the three $20 bills in his drawers. However Alex Walker found the money in the band of his hat. Joe was taken to the Chillicothe jail. Smith was given two weeks to prove he was innocence, but failed to do so. He, along with Jump, were found guilty and ordered to be hung. Preparations for the hanging of Jump and Smith were made. The scaffold was located near the Rock Island railroad and were a special made “double seater” made for the two men to be hung at the same time when two 3’x4′ trapdoors supporting the chairs they would be sitting on would open at the same time. The trapdoors would be sprung with the pitman rod used to kill Gladson. A rope was attached to a boom eight feet above the platform and spiked together. A fence was placed around the structure which only allowed a few select men to be inside. A black coffin covered with gunny sacks was placed under the steps. It is not know whether this photo is the crowd witnessing the hanging of murderers Joe Jump or John Smith. 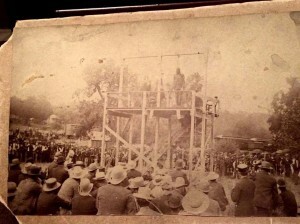 This first execution of 19-year-old Joe Jump attracted a huge crowd (estimated between 20,000 and 30,000 people); the Rock Island ran special trains to Gallatin for the benefit of spectators. Two weeks later the hanging of John Smith drew witnesses estimated between 8,000 and 10,000 people. On hanging day, both regular and special trains were loaded with passengers. Gallatin became a temporary city of 20,000 to 30,000 people. The previous night some 250 wagon loads of spectators camped near the Grand River bridge, and about 100 teams camped northwest of town. Daviess County Sheriff Witt had issued 50 invitations to other county sheriffs to attend. The sheriffs lined up by twos and marched to the depot to receive Jump. At the appointed time, Sheriff Witt started to strap him and put a black cap over his head. The sheriff unfastened the handcuffs, fastened the rope around his neck, and the murder weapon used to kill Gladson was used to set the trapdoor, letting his body fall seven feet. He was dead in 12 minutes. Joe Jump, 19, was executed by hanging on July 23, 1886, for the murder of William C. Gladson on Dec. 29, 1885. Jump along with John Smith killed the Iowa teamster to steal his Rock Island Railroad weekly paycheck. The public execution was performed just west of Route MM and a few hundred feet north of Highway 6 in Gallatin. A huge crowd (estimated from 20,000 to 30,000) witnessed the event; the Rock Island ran special trains to Gallatin for the benefit of spectators. John Smith, 22, was executed by public hanging on Aug. 7, 1886, for the murder of William C. Gladson on Dec. 29, 1885. Smith along with Joe Jump killed the Iowa teamster to steal his Rock Island Railroad weekly paycheck. Smith was executed on the same wooden gallows used to execute Jump just two weeks earlier before a crowd estimated between 8,000 and 10,000 people. When John Smith’s two weeks were up, the same ground preparations made for Jump’s hanging were used for Smith. The crowd was estimated to be between 8,000 and 10,000 people. At the appointed time the train carrying the prisoner arrived. Smith was escorted to the scaffold and seated by Sheriff Witt and Sheriff Smith. At roughly 12:00, the sheriffs began pinioning him. Soon, the pitman rod was used to open the trap door and 11 ˝ minutes later he was dead. About 40 people attended funeral services, which consisted of singing, praying and a short sermon. The body was taken to the Herdon Cemetery, where it was buried by Jump’s grave.